Our clients consulted Build Professional to discuss the possibilities of remodelling and extending their current home. Whilst their home had served them well our client’s came to the realisation that certain areas of the home were not functioning to their full potential and they desired a better flow and use of space whilst also modernising their home. Our client’s relationship with their current home changed when they began working from home and required a home office. Prior to the extension and remodel the office was located in a spare southern facing bedroom where the workspace was small, disjointed and tucked away from the rest of the home and lacked storage, warmth and natural light. The function of our client’s Master Suite was also an area of concern with the actual room lacking in size and requiring a more private entrance away from the entry of the home. The current ensuite and walk-in-robe were also lacking in space and storage and required updating. With the ensuite undergoing a renovation, the current main bathroom, toilet and laundry would also require updating to ensure uniformity throughout the home. The current kitchen also presented functional issues, whilst the size of the kitchen was reasonable; a new updated kitchen with better organisation and storage solutions was requested. Another desire was extra living space that would appeal to their lifestyle and to the overall functionality of their home. To freshen up their living areas our clients desired timber flooring throughout and replacement of the open fire place and brick mantle in the formal lounge with a new enclosed wood heater. The solutions that the Build Professional team established for the home were to firstly reconfigure existing spaces for better flow and functionality and this entailed creating a large home office maximising the north aspect to a new living area while maintaining a watchful eye not to disturb the existing solar panels. New joinery in the home office offered an abundance of storage. The location of the office is now saturated in natural light and is central to the hub of the home yet distanced enough from the living and entertaining areas. The remodel of the Master suite took over the existing third bedroom which was not being utilised to allow for greater space in the master bedroom that has generated a secluded retreat for rest and privacy. This design solution also created a generously proportioned renovated ensuite, a new entrance off the hall and better storage solutions with well organised built in robes. The main bathroom, toilet and laundry were also updated and new joinery in the laundry offered greater storage capacity. To create more living space we extended a magnificent living space with double glazed cedar windows and sliding door offering access and views to the meticulous north facing courtyard and garden. The northern aspect allowed the new living space and kitchen to bathe in warmth and natural light. The new living space integrates particularly well with the renovated kitchen that continues to play its role as the hub of the home. The functionality of the kitchen is now paramount with a much greater design whilst also being aesthetically modern. 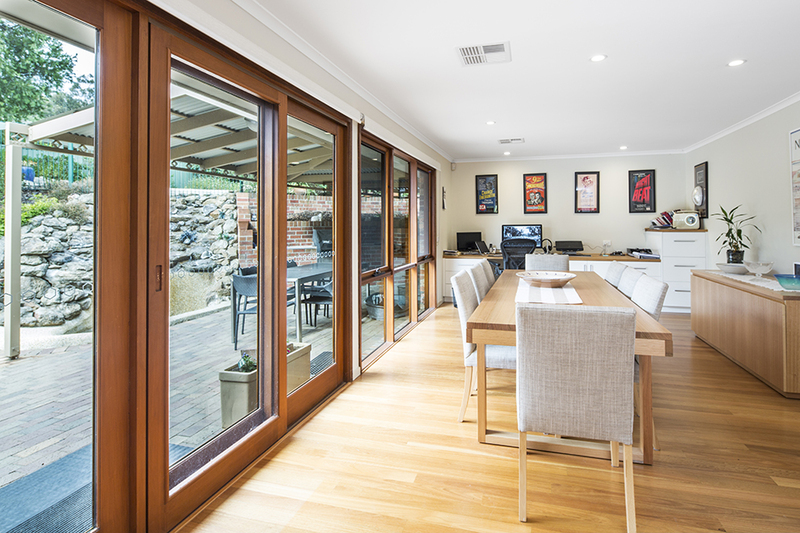 Beautiful blackbutt timber flooring was laid throughout the living areas and enhances the light and warmth of the home. A new enclosed wood heater replaced the open fire place in the formal lounge and the exposed brick mantle was rendered and painted for a contemporary appearance. Our client’s take great pleasure in living and working in their beautiful home which is now spacious, open and warm maximising the northern aspect and offering modern and greater living spaces with separate living and working zones effortlessly flowing together. The remodel of the master suite, ensuite, robes and renovated bathroom and laundry has also added great satisfaction to their lifestyle. This brief was all about functionality, modernisation, energy efficiency and creating a home that accurately accommodated our client’s home and working lifestyle to its full potential.